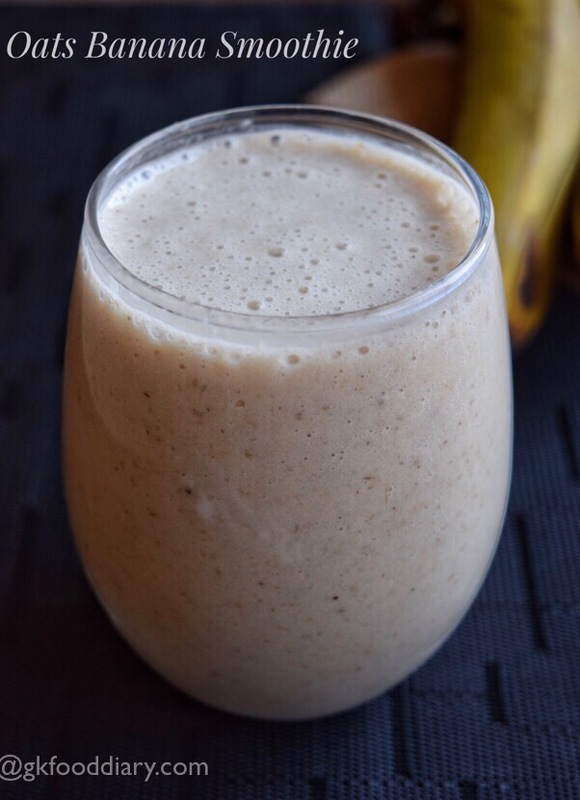 Oats Banana Smoothie- easy and healthy smoothie made with cooked oats, banana, nuts and milk. 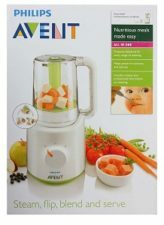 As moms, we always worried about kids nutrition especially when they are fussy about food. 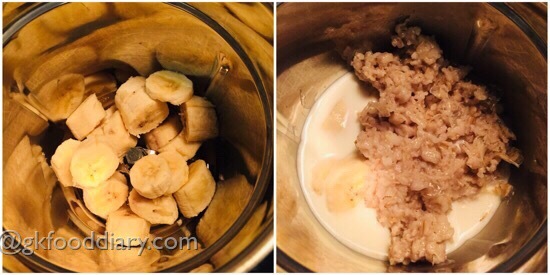 This oats banana is a best option for the picky eaters as its a total winner with kids, also its wholesome, filling and loaded with nutrients. Its very easy to prepare within minutes and can be given to kids form one year. Check out other oats recipes for toddlers and kids. 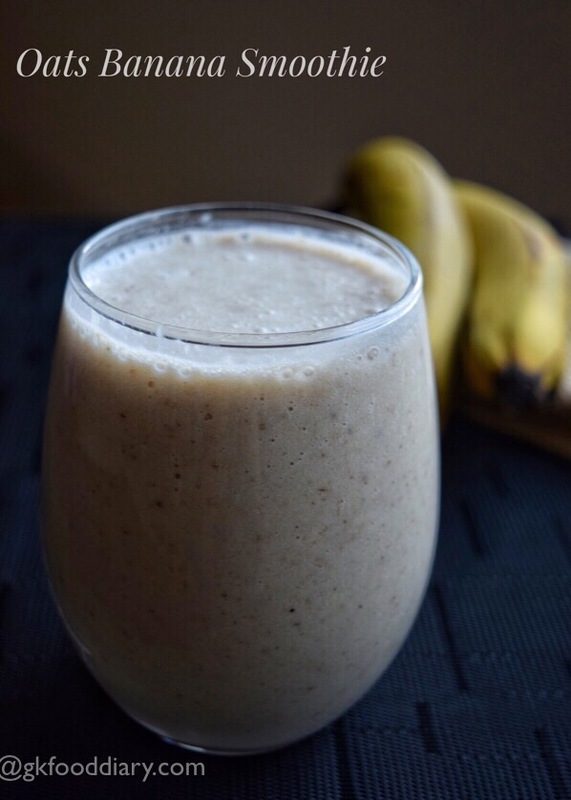 Now Let’s get on to check how to make this easy oats banana smoothie recipe for toddlers and kids. 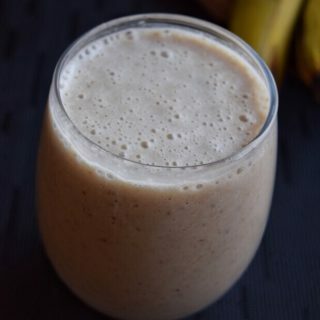 Oats Banana Smoothie - easy and healthy smoothie recipe for kids made with oats, banana and milk as main ingredients. Measure oats, milk and keep all the other ingredients ready. 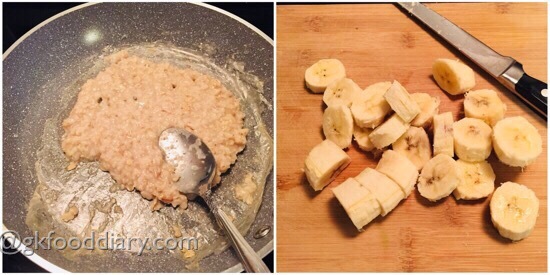 Take ¼ cup of oats in a thick bottomed pan, add ½ cup of water. Mix it. Cook the oats in low flame for 5-7 minutes or until its thick and soft. Switch off the flame once done and cool it down completely. In a cutting board, peel and slice the banana. Take the sliced bananas in a blender. Add milk and cooked oats.Make sure that the oats is completely cooled down before adding. Then add in honey and a handful of walnuts or nuts of your choice. Blend everything together until smooth, pour it in glasses and serve. 1. Measure oats, milk and keep all the other ingredients ready. 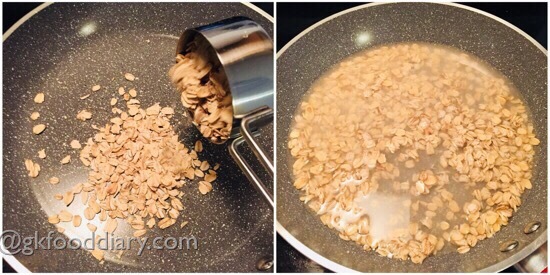 Take 1/4 cup of oats in a thick bottomed pan, add 1/2 cup of water. Mix it. 2. Cook the oats in low flame for 5-7 minutes or until its thick and soft. Switch off the flame once done and cool it down completely. In a cutting board, peel and slice the banana. 3. Take the sliced bananas in a blender. Add milk and cooked oats.Make sure that the oats is completely cooled down before adding. 4. Then add in honey and a handful of walnuts or nuts of your choice. Blend everything together until smooth, pour it in glasses and serve. 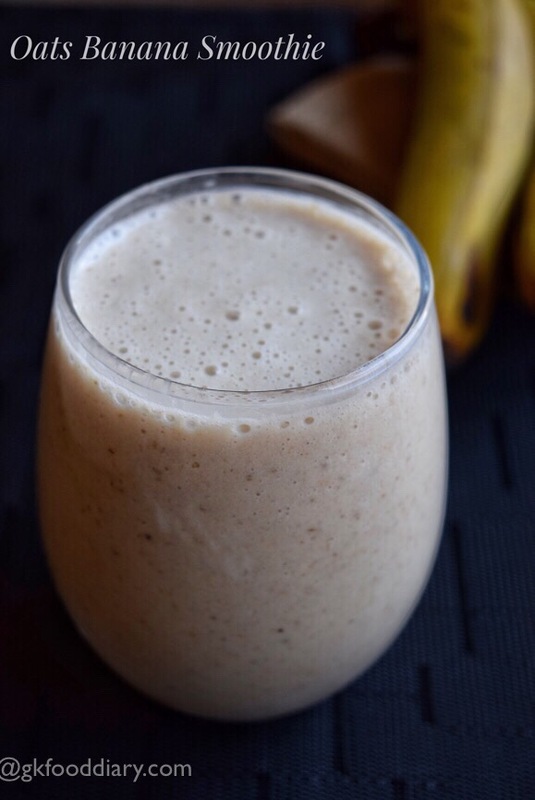 The oats banana smoothie is ready! Cook the oats in low flame until the raw smell leaves. Cooking time depends on the type of used. 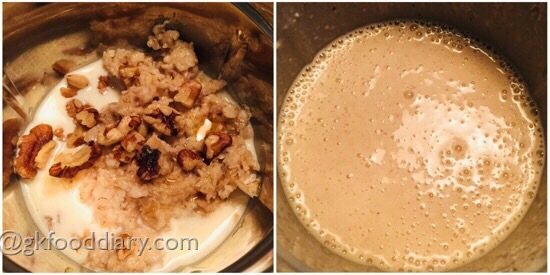 Make sure to blend the oats with milk only after the oats is completely cooled down. The drink should be smooth in consistency, adjust milk quantity accordingly. You can use skip nuts and make as a plain milkshake. 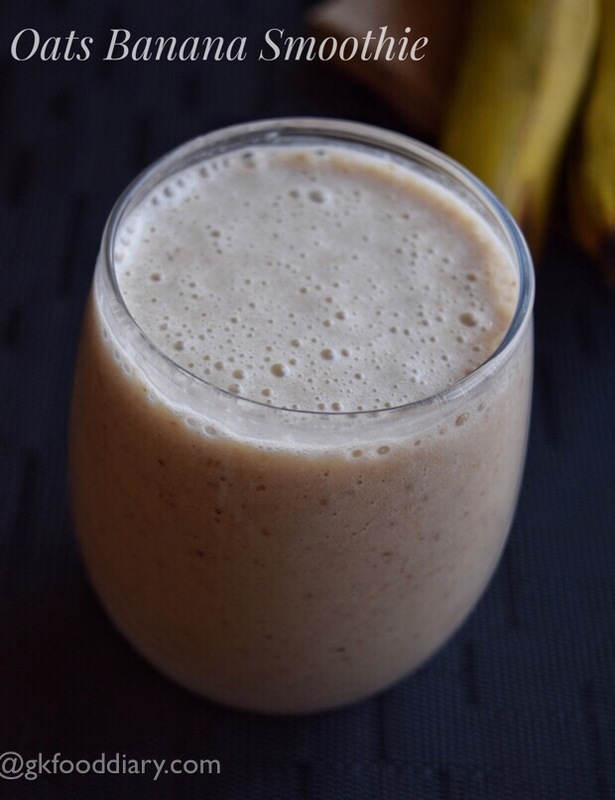 Make sure to introduce each ingredients separate to your baby, before you try this oats banana smoothie recipe.